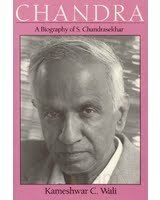 I went back to Nobel Laureate S. Chandrasekhar’s biography a few months back after 17 years. Chandra written by Kameshwar Wali was a birthday gift I gave to my wife a few months after she joined me in Buffalo, New York after our wedding. If you have given books as gifts to folks at home, you must be aware of the hidden agenda. I don’t remember who started reading the book first, but I was definitely the first one to finish it. It was the first biography I read where the hero of the story co-operated with the author in a frank manner and the author has done a splendid job with the narration. Why did I go back the book now? I had a specific objective – to re-read the story of “Chandrasekhar Limit” – the idea that languished for several decades before gaining acceptance by the scientific community eventually leading to a Nobel. It is a masala story with lots of twists and turns. It even has a villain, Prof. Eddington then doyan of Astrophysics, who launched a campaign to kill Chandra’s idea. But that would be a topic of a separate article. In this second reading of the book one of things that struck me was Chandra’s two serious attempts in getting away from Astrophysics. Why did Chandra try to do that? And what happened in each attempt? Let’s see briefly in this article. Chandra’s career in Astrophysics was more of an accident. By the time Chandra landed in Cambridge he had already published a paper based on the work of Fowler, a Fellow of the Royal Society. Chandra had encountered Fowler’s paper while browsing the newly arrived journals in university library in Madras. In fact, Fowler helped him secure admission at Cambridge. So it was natural for him to start his PhD work under Fowler in Astrophysics. 1930s were hey days of theoretical Physics as a totally new foundation known as quantum mechanics was being built. Chandra soon realized that working in Astrophysics was more like being on the periphery. The real action was in pure Physics. In the meantime, Fowler left Cambridge on sabbatical and Dirac who had nothing to do with Astrophysics became Chandra’s official guide. Chandra consulted Dirac who advised him to visit Niels Bohr and co in Copenhagen. Folks at Copenhagen indeed turned out to friendlier and it is here Chandra made his first serious attempt at pure physics. He wrote a paper titled “On the statistics of Similar Particles” and sent it to Dirac in Cambridge. Bohr had already given his nod. But pretty soon Dirac found an error in his paper. “My paper sent to the Proceedings of the Royal Society is WRONG. That is all” Chandra wrote to his father in Nov 1932. Over four months of work was down the drain. Pressure started building up to submit a thesis. Chandra went back to Astrophysics. Fortunately for Astrophysics, Chandra not only stayed with it but made a significant contribution in bringing Astrophysics part of main stream physics. Today 10% of the 12th standard Physics syllabus my wife teaches is Astrophysics. Incidentally, we will be hearing a lot more of Chandra in the coming months as this year is Chandra’s birth centenary year. In fact, Kameshwar Wali will be giving a talk at a conference on Chandra at Indian Institute of Astrophysics, Koramangala, Bangalore in December. I hope to attend it. Chances are high your most favorite YouTube video is very different from mine in its form and content. Mine is neither a funny clip nor a music video although I enjoy watching both kinds of clips. But here is what is perhaps common between your favorite video and mine. Like you, I have watched it a dozen times so far. But more importantly I have listened to the audio extract of the video several dozen times by now. I listened to it in the gym a couple of days back and I listened to it before going to bed last night. It is titled “Explorations of the mind” and it is an hour-long lecture given at University of California, Berkley by the father of behavioral economics and Nobel Laureate Prof. Daniel Kahneman of Princeton. Who is Kahneman? And what is this video all about? And why do I like it so much? Let me briefly describe in this article. Kahneman was born in 1934 (same age as my dad) to Jewish parents of Lithuanian origin and spent his childhood in France where his parents had migrated in 1920s. He says in his bio at the Nobel Prize site, “I had grown up intellectually precocious and physically inept”. His school PE teacher felt to pass him means to stretch his extreme tolerance. Kahneman made up for what he lacked in his physique by writing essays in a notebook like, “What I write of what I think”. Kahneman became a psychologist and together with Emos Tversky formulated a theory known as Prospect Theory. This theory turned upside-down a long standing belief among economists that human decision making is a rational process and eventually earned him a Nobel in 2002. This video is titled “Explorations of the mind: Intuition: the marvels and the flaws”. The video can be divided into three parts. Part 1 is where the speaker is introduced (0-4:20). In part 2 Kahneman sets the context and defines the question he is planning to address for the rest of the talk (4:20-20:10). Part 3 (20:10-55:05) is where he presents a simple and useful model that addresses the question. What is the question Kahneman addresses in this talk? It is as follows – On the one hand we encounter marvels of intuition when we see world class chess players, basketball players, fire fighters consistently making accurate decisions in a “blink” of an eye (check out Malcolm Gladwell’s Blink for stories on this). On the other hand, we have “experts” like the Chief Economists of the International Monetary Fund (IMF) Olivier Blanchard who on September 2, 2008 said, “If the price of oil stabilizes, I believe we can weather the financial crisis at limited cost in terms of real activity”. Within two weeks some of the biggest financial companies in the world collapsed (check out Nassim Taleb’s Black Swan for stories of these kinds). Why is it that the human intuition works beautifully in certain areas like sports and doesn’t work in some other areas like long term forecasting? Why do I find this question so interesting? I have a deep-rooted fascination for the learning process. And I believe this question is at the heart of this process. I encounter people all the time who have spent decades managing projects but have stopped learning a while ago. Surprisingly, they believe that with every passing year, they are learning more. But actually they are not. The talk sheds light on what happens when we learn or stop learning.